By way of the Capcom-Unity blog comes the most retro news of the day, and great news for fans of the old-school beat 'em up. 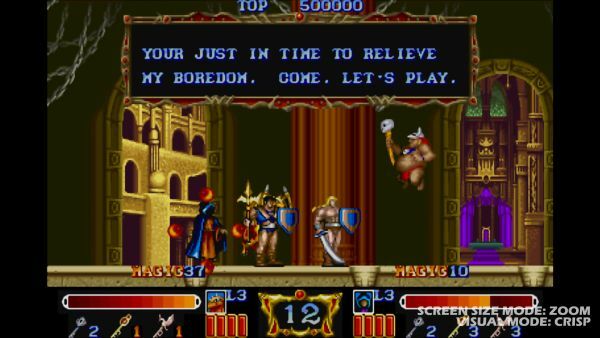 Coming to Xbox Live and PSN in April 2010, the confusingly-named Final Fight Double Impact contains ports of the arcade versions of Final Fight and... Magic Sword? Last I checked, that wasn't a Final Fight title, but I loved it all the same. Both will feature two-player drop in/drop out online co-op (we will assume local as well) powered by the same GGPO tech that has been featured in most of Capcom's recent releases. Capcom has been kind enough to post a gallery of screenshots, so check 'em out! Page created in 0.2592 seconds.